Out with the old and in with the new (year)! My 2nd Nita after the first I did as a pattern tester, and I was quite adventurous (maybe naive) in my fabric choice, having never sewn in faux leather before. It's a million miles from perfect and it was a tough sew, but I love it and it's my go to skirt to wear out for dinner/drinks! Number 3 is well overdue. My first attempt at outerwear and the garment that really made me think 'woahhhh I can actually do this'! Made in wax cotton with a jazzy lining; I'm sure it'll get wear for years to come. Combining my love for the B6178 culottes with a proper fitting bodice that I spent much time toile-ing and adjusting. It's not exactly a wear-on-every-occasion number, but it made an appearance at a summer wedding. I feel like I may have been overly critical about the Yona in my original blog post, but my love for it grows with (much) wear. The wool is so warm and soft and I still can't believe I MADE A PROPER COAT! My second pair of Turia dungarees, made with a few adjustments, some super careful topstitching, and a lot of consideration over the finish of the garment. I've worn them all summer and through to winter, swapping light tops for Rise/Fall Turtlenecks layered underneath. And not forgetting the ones that didn't make the list but almost did - my first Inari Tee Dress in black suedette, and my much used and loved Radiant Home Studio Retro Rucksack. I had big plans to make this in wine coloured velvet before Christmas, but never quite found the perfect fabric or the time to squeeze it in, so it's a roll over. One of my oldest friends is getting married in September - the first of our school gang! - so I think view D, without the contrast would make a pretty special dress for the occasion. And despite making my dress now being the norm, it still gives me the excuse to buy outrageous new shoes right?! I've been admiring the WATG knitted purses for a while now, and particularly like the ones they stocked as a part of the &OtherStories collab. Luckily for me, I snapped up the 'Tender Loving Clutch Kit' in the post-Christmas sale with the Beetlejuice yarn. I bought an extra cone of the 'Jersey be Good' yarn in grey and peach for seconds and thirds too! The sale's still on if you get in there quick! I came across this pattern recently having seen a great version made up by @sweeetbitter84 on Instagram (Erica Bunker sewed up a fab one here too). It's a pretty good match for recreating this skirt I saw on Pinterest, but would make a great Vivienne Westwood knock off in check/tartan too! After all the fun of sewing the Waver Jacket and Yona Coat, I've been feeling the need for a new outerwear challenge, and this one really will be a challenge! 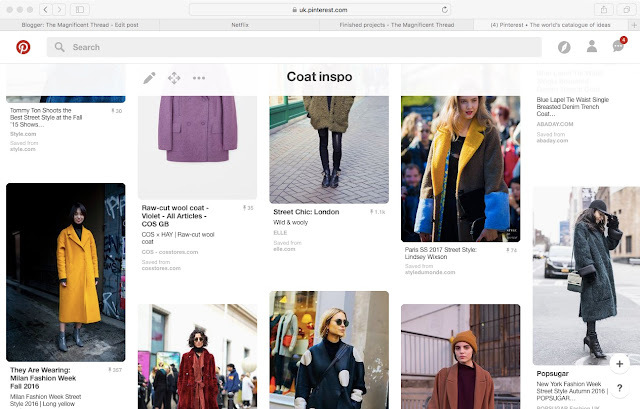 I bought the Named Clothing Isla Trench Coat with their advent discount, and although I want a classic Mac, I'm desperate to make one that has just a slight edge like the denim one worn in the street-style snap above. If I can pull it off, I'll hopefully be wearing it come Spring! I've been pinning my faves to a Coat Inspo board for a while, but I just can't seem to decide on what makes the perfect Winter Coat. I know it needs to be longer than the Yona Coat, and I'm thinking something a bit oversized (though as much as I like the one pictured above, I can't really see me in pink). Luckily I've got a coat to last for the time being, and quite a while to decide. Again, an image from Pinterest. I'm not sure where my sudden interest in denim has come from (I never wear jeans) but the mid-length Sew DIY Nita would look perfect in denim blue. In fact, I'd be up for making another Talvikki Sweater in orange too to copy the whole look! One of two patterns I chose as a prize for winning star make from The Fold Line. It doesn't look like too much from the cover, but when I looked at the line drawings, it was spot on for copying a couple of old blouses I bought years ago from Topshop. I'll skip the pocket on the front and make it in solid, block colour. I've slowed down on making the Kielo this year, but I'm keen to try sewing up a new one using the new facing tutorial. My first and long-time favourite Kielo's fabric is on it's way out, so I'll be looking for a nice crepe with a similarly good drape for the replacement. So much to make, so little time! I haven't had time to squeeze in more than the Deep V Tunic from Rosie Martin's book since I picked it up in late summer. I really enjoyed the process of drafting the pattern based on my measurements, so I'd love to give the book's Asymmetric Mini Skirt, Drip Drape Skirt, or Insert Skirt a try. And finally... venturing out and meeting sewing friends IRL across the year has probably had the most impact - sewing can be a solitary hobby, even with help of Insta/blog/other social platforms, so it's nice to immerse my real physical self in the real life world of fabric buying, chatting patterns and general loveliness! Thanks to everyone who I've met for being so friendly (and encouraging me to buy the fabric I was probably umming and ahhing about) and hope to see you all again and meet many more crafty people in 2017! Great round up, Shauni. I am still so impressed about your venture into coat making. Both coats/jackets look so smart. I also absolutely love your Flora jumpsuit. Looking forward to seeing your version of the Vogue 8956 skirt next year - I can totally see you in that. Thank you Jo! I'm impressed with the coat making myself - still can't quite believe I managed it haha. Great post, you've made some awesome pieces this year and I am so looking forward to seeing what you create in 2017. I love your style. Thank you Lynsey :) I feel like I'm really managing to make the sort of styles that I admire so much now, so your comment means a lot!